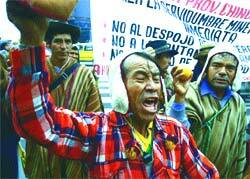 Peruvian local communities are on the warpath. They are accusing mining companies of not only causing contamination in the region, but also holding them responsible for the seizure of their land. More than 1,000 of these community members marched to the nation's capital, Lima, and demanded action against the big firms. "We want local communities to be consulted," said Miguel Palacin, a protester. Peru is the world's fifth-largest producer of copper and eighth-largest producer of gold. The mining industry is responsible for half of the nation's annual export income. But the interests of big mining companies, which want to harness the rich mineral wealth, are clashing with the lives of local farmers who are bearing the brunt of uncontrolled exploitation of the land. The pressure groups allege that instead of upholding a "law of mining servitude", whereby mining companies negotiate payment for agriculture lands and the authorities relocate the inhabitants, the government is luring foreign investments and is not interested in solving the problems of the farmers caused by the companies.